This would certainly apply to bears. The law does not, however, authorize individuals to kill bears seen in the area after the damage is done. Not many people are willing to take direct action against marauding bears. More frequently, they call a law enforcement official, including game wardens. Nuisance bear complaints currently come under the jurisdiction of Maine’s department of Inland Fisheries and Wildlife (DIFW). Game wardens and regional biologists are tasked with investigating nuisance bear complaints. In some cases, they may respond by recommending strategies to reduce conflicts with bears, while in others, they may trap and re-locate offending bears, or lethally remove them. In the latter cases, DIFW officials may delegate removal of bears to Animal Damage Control (ADC) agents. When deployed to handle nuisance bears, ADC agents are generally paid by the landowner. DIFW received more than 500 nuisance bear complaints during 2013. I do not know how many of these required direct action by DIFW and ADC personnel. I do know that fewer than a dozen bears are lethally removed annually. Do not confuse nuisance bear handling with population control of bears. Nuisance work seeks to address damage to individual landowners, but it does little to reduce the cause of the problem, i.e., too many bears for the natural food supply. It treats the symptoms, often temporarily, but not the problem itself. In some cases, offending bears have been relocated more than 50 miles from the problem area, only to return within a few weeks. In a few instances, nuisance bears dependent on human food sources and relocated into the woods where they could not find food, became hungry enough to attack people. In other cases, bears that have learned to get their groceries from people may become nuisances in their new home after relocation. Recreational hunting, practiced over extensive areas, is the most cost-effective and practical means of keeping black bears in balance with their habitat, and of minimizing conflicts with people. Passage of Question 1 will render recreational hunting ineffective for controlling Maine’s bear population. 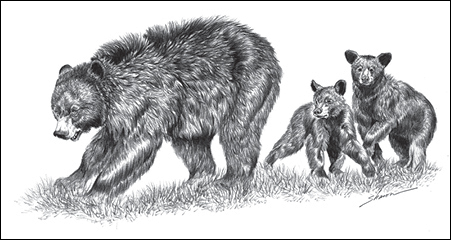 As bears increase in numbers, encounters with females defending cubs in settled areas will increase – especially when inexperienced, curious cubs wander onto human property. Illustration by Sharon Davis. Dealing with nuisance wildlife is expensive. It ties up scarce DIFW labor and funds. Nuisance bear complaints in Maine will increase dramatically if Question 1 passes. Costs to address these complaints will rise proportionately for State government, taxpayers, and landowners. Since DIFW also stands to lose considerable revenue if sales of bear permits plummet, as expected, to meet the added demand for nuisance bear damage abatement DIFW will need to cut back other enforcement and management efforts, possibly even reducing the scope of its own bear research program. Municipal and county police departments will spend more time and money dealing with initial contacts with landowners experiencing bear damage. Expanded deployment of ADC agents will also place additional costs directly on landowners experiencing bear damage. In addition, more and more landowners will need to pay the costs of repairing property and/or replacing pets and livestock destroyed by bears. Passage of Question 1 will change Maine bears from an economic asset to a fiscal liability, for both the public and the State. expert on deer, moose, coyote, and bear behavior.